Not playing around Thanks to tim jenkins who directed me to this in the first place, although I'll have to admit that I thought it was fake and looked it up myself to make sure it's real. What do you know, however, it IS real. 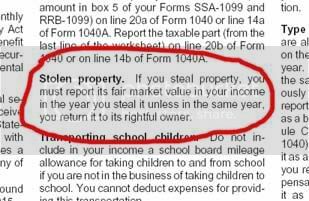 According to the US Tax Code in IRS document 525, page 32, if you steal something you must pay taxes for it, unless, that is, you give it back before the end of the year. That has got to be the funniest thing I've ever seen concerning the IRS. The picture above is very real. I took it myself and circled the actual code so you could see it. This is awesome!